The Art of War by Sun Tzu and On War by Carl von Clausewitz are known to everyone who studies war. But in the approximately 2,327 years that separated Man’s two most famous works of military tactics and strategy, a considerable number of less well-known works were published. Some were focused on specific or esoteric matters, such as Vauban’s Mémoire pour servir à l’instruction dans la conduite des sièges and Douhet’s Il dominio dell’aria. Others, such as Onasander’s Strategikos and Jomini’s Traité de grande tactique, were more general in nature. And all were written with the idea of permitting generals and other leaders of men to wage war more effectively. There are few better suited to write the history of strategy and military thought than Dr. Martin van Creveld, who has himself been a significant contributor to the literature of war. A Professor Emeritus of the Hebrew University, Jerusalem, Dr. van Creveld is one of the world’s leading writers on military history and strategy, with a special interest in the future of war. He is fluent in Hebrew, German, Dutch, and English, and has authored more than twenty books, including Fighting Power: German and U.S. Army Performance, 1939-1945 (1982), Technology and War: 2000 BC to the Present (1988), The Transformation of War (1991), and The Culture of War (2010). He is known for his development of the concept of “nontrinitarian” warfare as well as his contributions to the 4GW canon, and the editor of the There Will Be War series, Jerry Pournelle, has declared that “his work is a necessary supplement to Clausewitz”. A History of Strategy: From Sun Tzu to William S. Lind begins with the ancient Chinese military literature, then reviews the Greek, Roman and Byzantine works before proceeding to the Middle Ages. 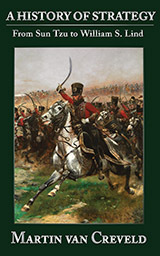 From Machiavelli and Montecuccoli to Guibert and Frederick the Great, van Creveld chronicles the gradual transition from medieval to Napoleonic warfare. Subsequent chapters delve into the literature of naval warfare, including Mahan and Corbett, then examine the works of the leading strategists of the early 20th century, including Moltke, Liddell Hart, and Ludendorff. The final chapter considers the modern strategists behind such concepts as Mutually Assured Destruction, terrorism, insurgency, and 4th Generation War. This brief, but wide-ranging history is an effective education in military thought. It is an excellent introduction to the various strategic works for the neophyte, and an illuminating summary of them for armchair and professional experts alike. Van Creveld not only describes each thinker and his most important contributions, but explains how one conceptual advancement led to another, and in doing so, makes it eminently clear why Sun Tzu and Clausewitz are so universally well-regarded by theorists and practitioners of war alike. EPUB and MOBI formats. No DRM. 116 pages.